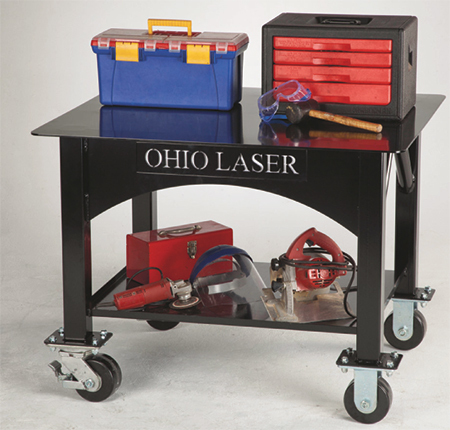 Ohio Laser, Plain City, OH, introduces the Mobile Work Table XL, a rugged all-welded steel wheeled cart that proves useful for heavy-duty industrial and manufacturing tasks. With a 5000-lb. distributed weight capacity, metalformers can use the worktable to move supplies and equipment throughout a facility move parts and assemblies between work stations; or use as a workstation in a packaging or shipping department. The Mobile Work Table features a 39- by 47-in. top work surface, a fixed bottom shelf for storage with a raised-lip edge design on three sides to retain parts. Phenolic wheel casters—two swivel with brake and two rigid—each provide 2000-lb. capacity.